March 9, 2018: More exciting news to report! Today, Justin Dellinger successfully defended his dissertation titled, "Impact of re-colonizing gray wolves on mule deer and white-tailed deer in north-central Washington". Justin's project was the first of three focused on the ecological consequences of wolf recolonization for prey and plant communities in eastern Washington, and he did a super job of kicking things off. Now, he gets to return to northern California, where is working for the California Department of Fish and Wildlife as a senior environmental scientist. Congratulations, Justin, and thank you for all of your hard work! We are also grateful to Matt Vanderhaegen of WDFW and Eric Krausz and Donovan Antoine of the Colville Tribes for making the long trek to attend the defense! ​March 1, 2018: Another achievement to report. Today, Laurel Peelle successfully passed her PhD qualifying exam and did so with distinction. Now, Laurel moves on to preparing for her general exam (proposal defense). In the meantime, she has earned some well deserved rest. Congratulations, Laurel, and thanks also to committee member Ben Maletzke for making the long drive over from Cle Elum to join us! February 14, 2018: We are very proud of Hannah Booth, the NSF Research Experiences for Undergraduates (REU) award recipient whose research falls under our Washington Wolf Project, for recently presenting a poster entitled, "The relationship between wildfire and the cascading impacts of predators on plants" at the joint meeting of the Oregon Chapter of the Wildlife Society, Washington Chapter of the Wildlife Society, Society for Northwestern Vertebrate Biology, and Northwest Partners in Amphibian and Reptile Conservation in Portland, Oregon. Now back on campus, Hannah will soon be venturing to the field in eastern Washington to complete here project. Well done, Hannah! January 12, 2018: Congratulations to PEL alumnus Dr. Tom Newsome, who today assumed his new role as a Lecturer (Early Career Development Fellow) at The University of Sydney. Good on ya, mate! January 8, 2018: Check out this new story on the Yellowstone field course (ESRM 459) that I co-teach every spring with John Marzluff and Monika Moskal! Many thanks to the University Marketing & Communications (UMAC) team (Jack Martin, Lauren Lee, Dennis Wise, Mark Stone, Jamie Swenson, Nick Bolton, Gina Hills, Jeff Hendrickson, Sasha Im, Nick Winkelbauer, Alex Bosco) and the College of the Environment for so deftly capturing how special this class is for our undergraduates. ​December 27, 2017: Publication alert! Our first paper from the Tetiaroa reef shark project is out in Marine Ecology Progress Series (Kilfoil et al. 2017). Thank you to Jimmy Kilfoil, who is working on his dissertation at Florida International University, for spearheading the effort! ​December 13, 2017: Congratulations to Lauren Satterfield, who yesterday successfully passed her PhD qualifying exam! Lauren will now be returning to the field for a winter of collaring cougars and chasing down cougar and wolf predation sites in the Method Valley of eastern Washington. Yes, we are all jealous! ​November 7, 2017: Thank you to Apryle Craig for acting as PEL host for 2017's Xi Sigma Pi Tour de Labs! ​October 16 and 24, 2017: Congratulations to Clint Robins and Lauren Satterfield for well received talks respectively titled, "Investigating the effects of urbanization on cougar foraging ecology along the wildland-urban gradient of western Washington" and "Competition in the forest: understanding ecological relationships between cougars and wolves in eastern Washington". Clint's talk was part of the School of Environmental and Forest Sciences Wildlife Seminar (ESRM 455, SEFS 554), whereas Lauren's featured in the 50th Anniversary Symposium of the Washington Cooperative Fish and Wildlife Research Unit. ​October 3, 2017: We would like to direct your attention to a new paper in Proceedings of the National Academy of Sciences of the United States of America titled, "Extinction risk is the most acute for the world's largest and smallest vertebrates". Led by long-time collaborator Professor Bill Ripple and also involving former PEL post-doc Dr. Thomas Newsome, the paper shows that a variety of stressors are truncating the vertebrate size spectrum at both ends. Thanks, Bill, for including us in this exciting work! ​August 8-9, 2017: Thank you to the Pacific Science Center and Central Cinema for inviting us to participate in Science and a Movie presents Jaws! The Science and a Movie series offers moviegoers the chance to learn about research that is related to classic films. As part of the two night event, I (AW) got to give a talk titled, "Tiger sharks keep seagrass ecosystems healthy by scaring sea turtles" and then fielded questions from the audience about shark biology and the portrayal of sharks in cinema after the screening of Jaws (one of my favorite movies). Special thanks to Anna Ferrario of the Pacific Science Center for making all of the arrangements! July 14, 2017: I (AW) had fun presenting the results of our work with wolves in eastern Washington ("All bark and no bite? Impacts of recolonizing gray wolves are primarily non-consumptive in a managed landscape of western North America") as part of a symposium titled, "Managing novel communities and multiple threats to achieve biodiversity outcomes” at the 12th International Mammalogical Congress in Perth, Western Australia. 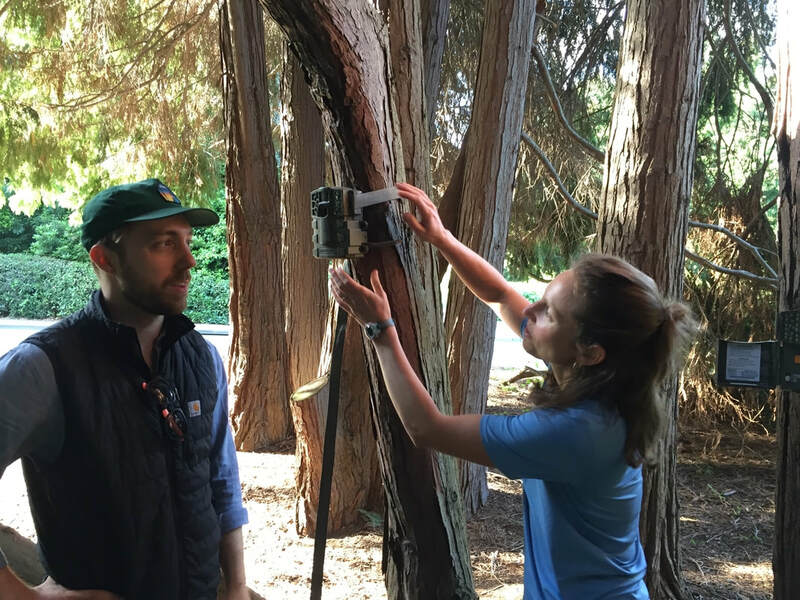 ​June 28, 2017: This evening, Lauren Satterfield and Apryle Craig offered a free workshop to School of Environmental and Forest Sciences undergraduates titled, "Foundations of GPS and Camera Use." 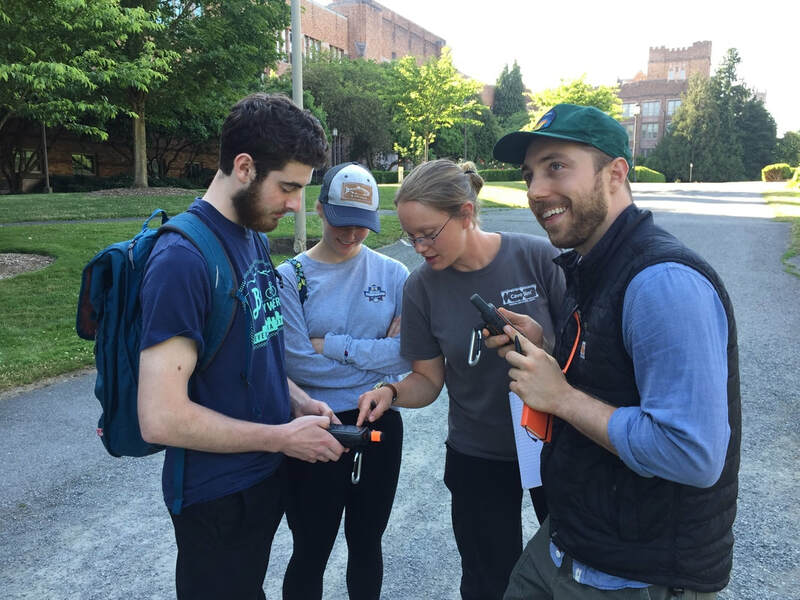 Participants got the chance to use GPS units to navigate the UW campus, and to deploy and check motion-activated trail cameras. Thanks for so generously donating your time and helping to train the next generation of wildlife scientists, Lauren and Apryle! June 27, 2017: Today, Laurel Peelle and Lauren Satterfield ventured to Seattle City Light's downtown headquarters to deliver talks titled, "Predator identification from saliva at kill sites with limited remains " and "Wolf-cougar interactions in eastern Washington," respectively. Seattle City Light's Wildlife Research Grants Program has long been a generous supporter of the PEL, and we are grateful to Laurel and Lauren for building on this partnership! ​May 31, 2017: Shannon Kachel will be sharing stories and insights from his PhD research on interactions among snow leopards and wolves in Central Asia, as part of UW's Engage Speaker Series at Town Hall Seattle at 5:30 on June 5. Tickets are free for UW students, and only $5 for the general public. ​May 24, 2017: We are pleased to announce that, today, Clint Robins successfully defended his Master's Thesis titled, "Investigating the effects of urbanization on cougar foraging ecology along the wildland-urban gradient of western Washington"! Happily, Clint will be continuing on in the PEL to complete his doctorate, which will address the influence of western Washington's wildland-urban gradient on cougar hunting behavior and interactions with black bears. His PhD research will be supported by a $20,000 grant from Conservation, Research and Education Opportunities International (CREOi). Excellent work all around, Clint! ​May 23, 2017: We also have a new paper to report, published today in Nature Communications! The article ("Top predators constrain mesopredator distributions") reveals that large carnivores such as gray wolves and dingoes need expansive ranges to suppress smaller competing predators including coyotes and red foxes. The paper is covered here by the University of Washington. ​May 23, 2017: Congratulations to Lauren Satterfield, whose proposal to the Washington Department of Fish and Wildlife Aquatic Lands Enhancement Agreement (ALEA) program titled, "Assessing wolf-cougar interactions and impacts in Washington" was funded today to the tune of $16,200. The grant will support volunteer involvement in her field work, which this summer will entail visiting cougar kill sites in eastern WA (among many other things!). ​May 19, 2017: We are also pleased to pass along that Erin Strand, another of our undergraduate interns, presented a poster titled, "A test of the mesopredator release hypothesis in a multi-use landscape" at the recent Undergraduate Research Symposium in Mary Gates Hall. Great job, Erin! May 18, 2017: Happy news to report from Hannah Booth, who was just received a prestigious Xi Sigma Pi Undergraduate Research Award in the amount of $700 for her proposal titled, "The relationship between wildfire and the cascading impacts of predators on plants"! Hannah has been working with Apryle Craig as an intern in our lab and will now be able to travel to our field site in eastern Washington to examine the impacts of the historic fires of 2015 on wolf-prey-plant interactions. Way to go, Hannah! ​April 26, 2017: Continuing the positive momentum, we've just published another paper in the journal Biological Conservation, this time on the impacts of domestic dogs on threatened wildlife. Led by Tim Doherty (of Deakin University in Melbourne, Australia), the paper is the most comprehensive survey of the effects of feral and owned dogs on wildlife to date, and highlights their impacts as an under-appreciated conservation challenge. ​April 5, 2017: We just published a paper in Bioscience ("Making a new dog?") examining the possibility that increasing exposure to human foods and other resources might disrupt ecological roles of large carnivores and, in the case of wolves, reinitiate the early stages of domestication. Led by former PEL post-doc Thomas Newsome, the paper has already received considerable media attention (e.g., https://oxfordjournals.altmetric.com/details/18533051/news). ​March 28-31, 2017: We are proud to have had Apryle Craig and Laurel Peelle represent us at the recent Joint Meeting of the Washington Chapter of the Wildlife Society and the Washington State Society of American Foresters in Yakima. Apryle presented a poster titled, "Do recolonizing wolves impact deer hunter success? ", and Laurel presented a talk titled, "Predator species identification from saliva at kill sites with limited remains". ​March 29, 2017: Congratulations to Carolyn Shores, who today successfully defended her dissertation proposal titled, "Ecological effects of disturbance on carnivore and ungulate communities in northeastern Washington state" and thereby advanced to candidacy! ​March 25, 2017: Lauren Satterfield and Apryle Craig attended Comscicon, a 2-day science communications workshop. ​February 7, 2017: Félicitations to Apryle Craig, who today was awarded a NSF Research Experiences for Undergraduates (REU) supplement, which will enable her to add an undergraduate research project to her ongoing study of the effects of wolf recolonization on deer herbivory and plant community responses in eastern Washington! Apryle has tirelessly championed undergraduate involvement during her tenure as a PhD student in the PEL, and this prestigious award is a well-deserved testament to her efforts. ​November 5, 2016: Thank you to Laurel Peelle for representing the PEL at this year's Burke Museum Meet the Mammals event! ​October 28, 2016: Check out this great new blog post from Panthera about Shannon's snow leopard research! The photo of the first male caught by the Kyrgyzstan project (M1) is courtesy of Sebastian Kennerknecht. ​August 19, 2016: This past Friday, Carolyn Shores became the latest PEL doctoral student to pass the qualifying exam. After this major hurdle, she now gets to spend some time relaxing in Ireland. Well deserved, Carolyn! ​August 15, 2016: Congratulations to Shannon Kachel, who just passed his doctoral qualifying exam! As reward, Shannon now gets to return to Kyrgyzstan for another field season of snow leopard research. ​July 27, 2016: Today, with lead author Professor Bill Ripple (Oregon State University) and many other co-authors, we published a paper in the journal Bioscience titled, "Saving the World's Terrestrial Megafauna" that both highlights the plight of these species and calls for increased efforts to preserve the ecosystem services and economic benefits with which they are associated. July 18, 2016: Publication announcements! Shannon Kachel co-authored both a book chapter on the state of the art and science of camera trapping in the book Snow Leopards in Elsevier's new Biodiversity of the World series as well as an article on snow leopard food habits in the Wildlife Society Bulletin. ​July 12, 2016: Michael Havrda was recently interviewed about his research by KOMO TV, and the story, which aired yesterday as part of the network's evening newscast, is now posted on their website. Keep up the great work, Michael! ​June 25, 2016: The PEL has a new member! Recently, Lauren Satterfield joined us as a PhD student who will explore wolf-cougar interactions as part of a new study we're conducting in partnership with the Washington Department of Fish and Wildlife. Welcome aboard Lauren! ​June 9, 2016: Today, in collaboration with Dr. Michael Heithaus (Florida International University) and Patrick Greene (Symbio Studios), we completed a video lesson based on the Washington Wolf Project. The lesson is designed for use at multiple grade levels – from elementary to high school - and facilitates learning about ecosystems, animal behavior, the importance of predators, and how ecosystems and animals respond to environmental changes.​ It also includes a teacher packet with suggestions for how to extend the exercise and differentiate instruction. The video will reach thousands of students as part of the Houghton Mifflin Harcourt’s Science Fusion program. Thanks Mike and Pat! ​May 20, 2016: Nina Mowat, Christine Phelan, Kyra Kaiser, and Tiffany Lloyd presented a poster with the results of their analysis of deer travel time using animal-borne video data at the Mary Gates Undergraduate Research Symposium. We are grateful for their help on the Washington Wolf Project! ​May 13, 2016: Michael Havrda is looking for community members like you to allow us to place a remote camera on your property to collect data for our new research study: the Washington Urban–Wildland Carnivore Project. ​April 5, 2016: Under Dr. Newsome's leadership, today we published a global review of gray wolf food habits. The effort involved experts from around the world, including several other members of the PEL. March 30, 2016: Thanks to Michael Havrda and Clint Robins, who recently spoke to high school students while taking part in the Mercer Slough Environmental Education Center's Environmental Science and Technology Practicum. Michael and Clint helped to provide the participating students with a hands-on survey of environmental science careers, and from the feedback we received were "nothing short of awesome". Nice work, guys! ​March 17, 2016: Today, Laurel Peelle successfully defended her Master's Thesis, which focused on using saliva DNA from kill site remains to identify predators of snowshoe hares in north-central Washington. We congratulate Laurel for her excellent presentation and are happy to report that she will be continuing on in the PEL to complete her dissertation! ​March 10, 2016: Carolyn Shores has received rave reviews for a talk she gave to the Seattle Mountaineers Naturalists Study Group entitled, "The return of wolves to the American West and the balance of nature". Bravo, Carolyn! ​March 4, 2016: Clint Robins, Apryle Craig, Shannon Kachel, and deer behavior intern Christine Phelan presented at the Graduate Student Symposium. ​February 24, 2016: King 5 News aired a story on the urban-wildland carnivore research being conducted by Predator Ecology Lab Masters student Michael Havrda. A collaboration between the University of Washington and Woodland Park Zoo, the urban-wildland carnivore project is examining ways to promote successful coexistence between humans and carnivores in Western Washington. ​February 22, 2016: Congratulations to Jeff Harris, who successfully defended his Master's Thesis today! His talk did an excellent job of distilling the results of an effort to model the weaning process in California sea lions. We wish Jeff well as he moves forward at the National Marine Mammal Laboratory, and thank him for being such an enthusiastic and collegial member of the PEL! ​February 18, 2016: Predator Ecology Lab PhD student Shannon Kachel's snow leopard collaring work is highlighted in the March 2016 cover story of the Smithsonian as part of a larger story on partner/collaborator Panthera's research and conservation efforts in Kyrgyzstan.